Prayer Map is designed to connect Christians individuals and Christian organizations together in prayer across a community, city, state, and nation. Instead of submitting personal requests for prayer, Prayer Map encourages The Church to engage in intercessory prayer for one another. 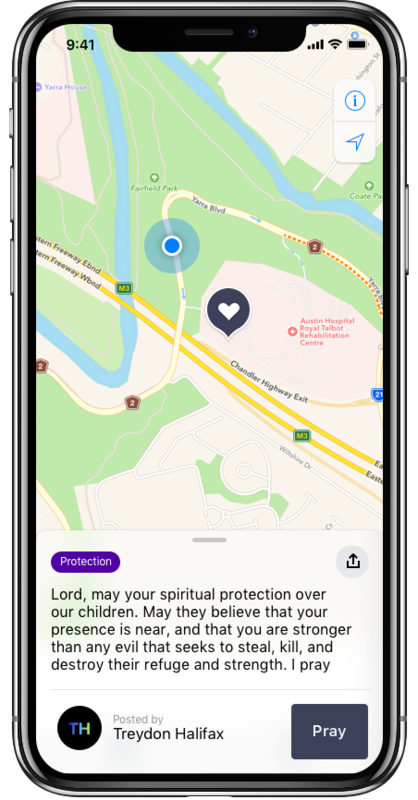 Prayer Map allows you to post prayers on a map, allowing others to pray with you, creating virtual prayer meetings across the city. Father, protect the children at this school and in this city. Encourage the teachers. Give them understanding, wisdom, and discernment as they teach. Let the Christ Followers in this school and all the schools in this city be filled with Your Spirit and Your Love and make them a light. Father, comfort the sick in this city. Let them experience You in the darkness of their circumstances. Bring your healing across this city. PRAY FOR THOSE WHO NEED A HAND UP. Lord, bring an end to hunger in this city. Show me how and where I can be Your hands and feet to those in need. Post and assign your prayers to any specific location on the map. Search, discover, and intercede for the physical and spiritual needs in your community, city, state, or anywhere in the world. When you post a prayer, choose a category or create your own. Know that others are joining you in prayer for your community. You’ll receive a push notification when someone taps the “Pray" button on your prayer. Become a Prayer Map Partner to display your church or ministry with a special icon on the map. Let people know where to find you and how your ministry is impacting the community. Let people know how they can support your ministry and come along side you in prayer for the city. As Christians we believe God is actively involved in the concerns of his people. Like a loving Father he is moved by the appeals of his children. For that reason, prayer is a significant mission for every Jesus follower. Jesus calls us to love our neighbor and prayer inclines our hearts toward love. Prayer Map is designed to help us love our communities by praying for our neighbors (even those we don’t know). Prayer Map connects Christians individuals and Christian organizations together in prayer across a community, city, state, and nation. Every heart on the map is a prayer, and behind every prayer is a desire for God’s love and grace to intersect with the needs of individuals and communities to bring unity and hope. Down every street in every town, people are hurting and needing. As the Church joins in prayer for the needs of others, we grow more understanding, more compassionate, and more motivated to do something more than prayer. We develop a desire to be the hands and feet of Jesus and go where he sends us. The Church should not act like a bunch of separate entities with different missions. We should be intertwined and interconnected like streets on a map. Prayer for one another is the first way the Church needs to be engaged together across the city. When our prayers reach out into the community and join with the prayers of other Christ Followers, the Church is able to provide safe havens and resource to stop the erosion of communities.